Description: Travelers looking to explore areas more “off the beaten path”, or ecologically significant would be enticed to take a trip out to Nyungwe Forest National Park. 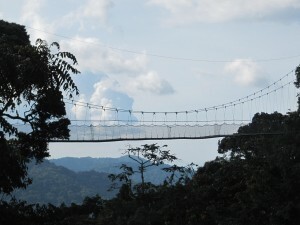 Nyungwe Forest National Park is Rwanda’s most important and diverse area of biodiversity. The park protects one of the oldest rainforests on the continent of Africa. All 13 primate species call this forest home, including a chimpanzee population ranging from 500-1000 members. Colobus and the localized L’Hoests monkeys can also be tracked with a guide. For the botanists and birders, the park offers over 200 tree species and 310 bird species recorded, many of which are only found within Nyungwe National Park. Those unafraid of heights can get a particularly good view of the canopy by walking along the region’s first and only suspended canopy walk. This activity not only gives visitors a truly unique perspective to soak in Nyungwe National Park, but it offers the chance to view quite exotic looking birds who call Nyungwe’s rainforest canopy layer home. The diverse ancient rainforest of Nyungwe is a true gem in the heart of Africa. Location: Southwest, close to Burundi border. 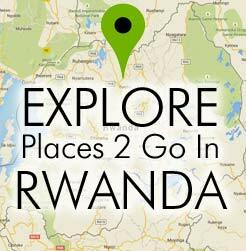 Four hour drive from Kigali to park’s East entrance. Time: 2-3 days depending on how many activities elected.